Danielle Becker was drawn to elder law after her grandmother needed the services of an elder law attorney for estate and Medicaid planning. 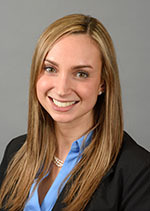 Danielle was so impressed by how helpful and knowledgeable the elder law attorneys were, she decided she wanted to help others in the same way by attending law school at Hofstra University. There she focused her studies on elder law and estate planning. Prior to joining Ettinger Law Firm, Danielle began her elder law career representing clients in guardianship matters, probate and estate administrations, and estate litigation. Ms. Becker also drafted estate planning documents including wills, trusts and advanced directives. Her experience handling these matters led her to the conclusion that individuals and families should be proactive by planning for their futures to diminish the need for the lengthy, costly and emotionally trying court proceedings. This drew Danielle to Ettinger Law Firm, a law firm whose values mirror her own. Ms. Becker is a Nassau County native and currently resides in Flushing, New York.